Is your New Year detox in full swing? Perhaps you’re trying hard to start 2019 by avoiding all things naughty and hoping to lose a few kilos in the process. I say trying because giving up things that taste great is never easy. Yes, most detox regimes can feel like deprivation – as it’s challenging to prepare healthy meals that are super low in calories and carbohydrates that also tick the boxes of being delicious, filling and feasty. 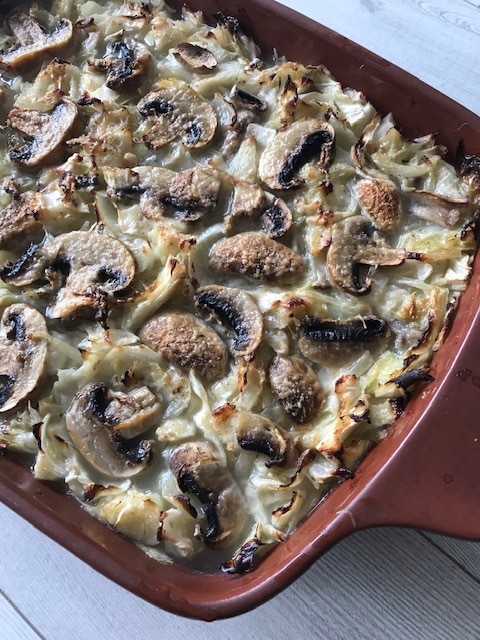 That’s where this super simple cabbage and mushroom bake comes in. It’s detox friendly whilst at the same time being satisfying and tasty. And of course if you’re not counting calories and carbs then serve this bake with some crusty bread and a good grating of Parmesan! This recipe was inspired by a classic Italian cabbage dish called ‘Peasant Soup’. It originates from the island of Sardinia and is basically a soup made from simple budget friendly staples, like onions, beans and stock – and of course cabbage. Here’s my version…..
Heat the oil in a large pan, then thinly slice the onions, garlic and cabbage. Add the onion and garlic to the pan and cook for a couple of minutes. Then add the cabbage and continue to cook for 5 minutes. Turn off the heat and add the oregano or basil, nutmeg and salt and pepper and mix well. Optional – add anchovies (highly recommended) and/or cannellini beans stir them through the cabbage mix. Transfer the mixture to an oven proof baking dish and pour over the stock. Finely slice the mushrooms and place them in a layer on top of the bake. Optional – generously grate over some parmesan. Bake in a pre-heated oven at 180C for 20-30 minutes. It’s that simple – Happy New Year and with recipes like this here’s to happier detox routines! Tags: bake, cabbage soup, Italian, recipe, vegan. Bookmark the permalink. Yep, just started this January’s metabolic diet. This sounds delicious, I may have a go at modifying it for phase II eating which is high protein and low carb (but no diary). 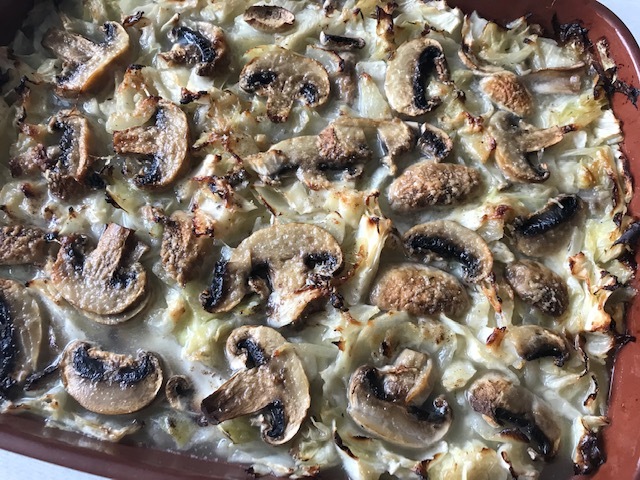 Hi Liz – a metabolic diet – now that sounds interesting….you could easily up the protein in this recipe by including the anchovies and/or the beans. happy New Year! Thanks Sandhya and I agree – the anchovies are a great addition. I’m sure eating this every day would see the pounds melt away – not that you need to change anything! Wonderful detox recipe, I would love to try. Thanks Megala and happy new year to you too! Ah thank you and glad you like this bake – I’d love to hear how your version turns out! That’s so good to hear and you could also add olives and capers as a salty alternative to replace the anchovies! Gorgeous dish Laura. 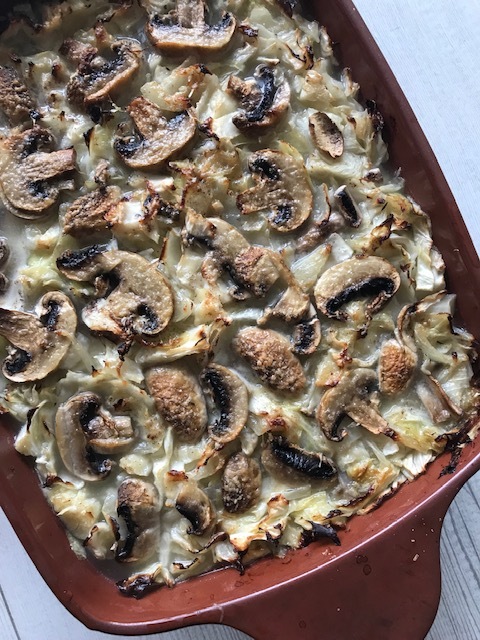 I love both cabbage and mushrooms, not sure why I’ve never paired them together. Thanks Annika – I thought the same when I tasted this dish!